Thousands of people all over the world are already signed up to participate in Bike Travel Weekend during the weekend of June 1–3. You’ve registered an amazing trip, now share it! Facebook, Instagram, Twitter … you know the drill. Post photos, use the event hashtags, and help inspire others to join. Encourage your friends and followers to register or join a trip on the Find A Bike Overnight page. An extra incentive: everyone who registers by May 27 is automatically entered to win a Co-Motion Cycles Divide bike and a trip for two, with bikes, to Glacier National Park on Amtrak. New this year, Bike Travel Weekend registrants/ride leaders can get extra entries in the sweepstakes by getting their ride participants to fill out the entry form. Use a sample image or post your own image on social media. Creating a Facebook event page for your trip will help build excitement. Invite people to join you, track RSVPs, and keep everyone informed about plans. Use the template Facebook event page text on the Promote Your Bike Overnight page or be creative and come up with your own. If social media isn’t your thing, send out an email to your friends, family, coworkers … anyone you think might want to join the adventure. Use the sample Bike Travel Weekend newsletter article or press release on the Promote Your Bike Overnight page to draft your email. If your cycling club, bicycle advocacy group, or other community group wants to organize a Bike Travel Weekend trip or just promote BikeTravelWeekend.org, the sample newsletter article and press release on the Promote Your Bike Overnight page will help you inspire others to join. Include the Bike Travel Weekend logo and Bike Travel Weekend graphics in your communications. Encourage your bike clubs, bike shops, tour companies, bicycle/pedestrian advocacy groups, outdoor- and recreation-focused organizations, and tourism agencies to participate in Bike Travel Weekend. 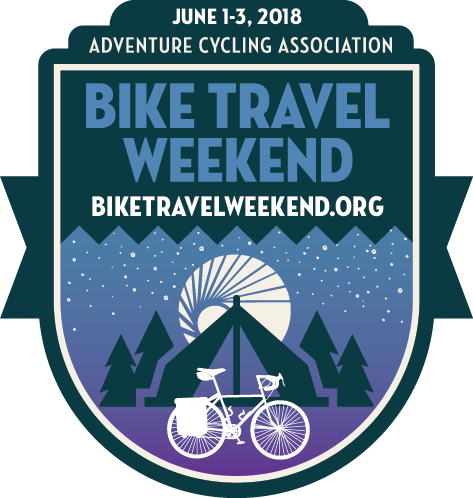 Maybe they just want to help promote Bike Travel Weekend to their customers, members, and the public by encouraging them to go on a trip during the weekend of June 1–3. Better yet, they can be part of the fun and plan a Bike Travel Weekend trip themselves. Either way, the Bike Travel Weekend Toolkit is designed with partner organizations in mind and includes everything they’ll need to know. Print out this poster, fill in the blanks with details about your trip, and hang it up in your community. Contact us and we’ll mail you Bike Travel Weekend stickers to share with others. Drop them off at businesses and organizations like bike shops, bike clubs, outdoor recreation stores, and community centers. Download a printable Bike Travel Weekend flyer and poster to distribute in visible locations as well. Contact us and we’ll send you stickers for your group or to distribute in your community. Now you can purchase Bike Travel Weekend t-shirts (women’s and men’s cuts) and socks directly from Adventure Cycling’s Cyclosource store. Wear your support for Bike Travel Weekend. If you’re doing one or more of the steps above, ta-da ... you’re a Bike Travel Weekend Influencer! Yep, it’s that easy. Now let us reward you for your efforts: Sign up to be a Bike Travel Weekend Influencer by filling out this form and we’ll mail you a super sweet Bike Travel Weekend lapel pin as a thank-you gift. We’ll also stay in touch with you regarding ways you can continue to share the bike travel love. Sign up to be an Influencer and we’ll send you one of these lapel pins. All of these resources and more are on the Bike Travel Weekend Promote Your Bike Overnight page. Thanks for being part of the bike travel movement by helping inspire people all over the world to travel by bicycle.